If Hanoi is the elegant, cultured older sister, then Ho Chi Minh City is the scruffy naughty little brother. A chaotic jumble of neon lights, motorbikes and noise, the city is recognised for its nightlife, its contemporary art scene and its high-rise buildings packed with entrepreneurial start-ups. 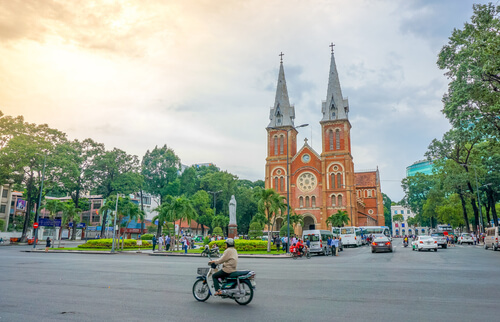 Many people still call the city its former name, Saigon, which it was called during the brief period of South Vietnamese independence (1955-75) and, although the city name was changed to Ho Chi Minh City (HCMC) still many locals refer to its old name. Like so many Vietnamese cities, French influence can be felt throughout the city – not least in its architecture. District 1 is where most of the colonial architecture can be found. 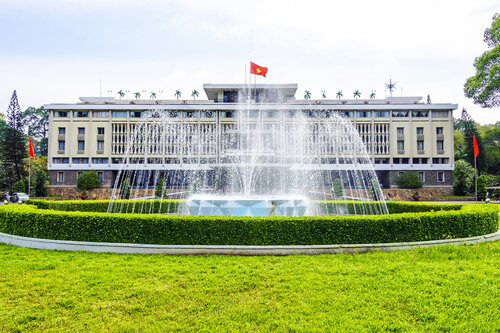 Look out for the Reunification Palace, the Municipal Theatre and, the Hotel Majestic and the Notre-Dame Cathedral and a stroll around the streets of this district. For war buffs, pop in for a drink on the roof of the Rex Hotel – a popular hangout for war correspondents in the 1960s. The American war hangs over Saigon still, albeit gradually fading into the history books. The War Remnants Museum is a sobering look at the consequences of chemical warfare and indiscriminate destruction, and the nearby Cu Chi Tunnels, shows the vast network of underground tunnels used by the Viet Cong. They show some pretty gruesome ways the guerrillas maimed and tortured American captives. South Vietnam is known for its water puppet theatre – musicians and singers entertain, whilst puppet masters make their puppets dance along the water. Try the Golden Dragon Water Puppet Theatre which has daily shows. For a more contemporary take on the city, head up to the Eon Heli Bar at the Bitexco Financial Tower for a glass of wine overlooking the modern city. The price of a drink is about the same as the price of a ticket to the Skydeck but a lot less busy and a lot more fun. Or check out artist run space San Art or Sao Lao to witness what HCMC’s booming contemporary art scene. District 1 – is where a lot of businesses are based, located around the older French colonial part of town. Most of the nice hotels, and more and more bars and restaurants are emerging in this area. Try Malt for a craft beer or for something more local just pop yourself done on one of the plastic chairs on the street for a cocktail at Rum Bar. Before you go, try your hand at haggling for some souvenirs at Ben Thanh market. Whether its fans, ceramics or chopsticks, make sure to bargain hard.